This past weekend, I had a girls weekend in San Diego. And... I'll admit it... it was AMAZING. Good friends. Good food. Good times. I first talked about the getaways that I went on a couple months ago. (I just re-read part of my post from last time and saw that I said I was way too busy talking, eating, and scrapping to take pictures and well...that happened again. Blogger fail. Next time?!) For those of you who might not have read about it, my friends Michele and Erin host a scrapbook getaway weekend at a huge house in San Diego. I go scrapbooking for the weekend. My co-workers all know by now what I'm doing (and have stopped making fun of me), but I neglected to tell them for a while because...well...most of them are guys and TOTALLY do not understand, nor do they care to. So now I just say I'm going to San Diego and they go "oh for that...stuff you do". Yep. Exactly. The first day was spent catching up with friends, shopping, eating, and a little bit of scrapping. And then, right before dinner, something really fun happened. I am normally HORRIBLE at selfies, but I'm actually pretty impressed with these! They are obviously more fun than serious, but I love how they turned out. Especially the bottom left. 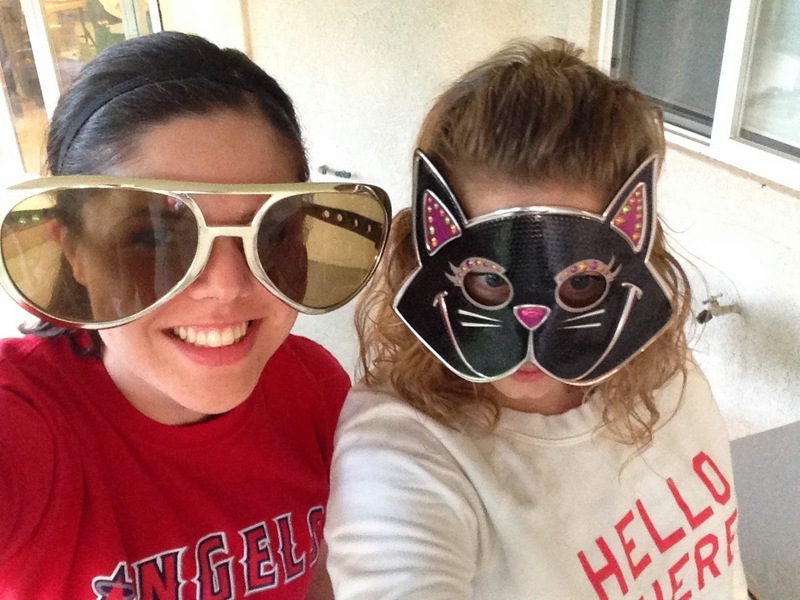 My friend Christine had brought these fun glasses and we just went to town. We were like kids in a candy store. I've never seen grown adults have so much fun with something so silly. 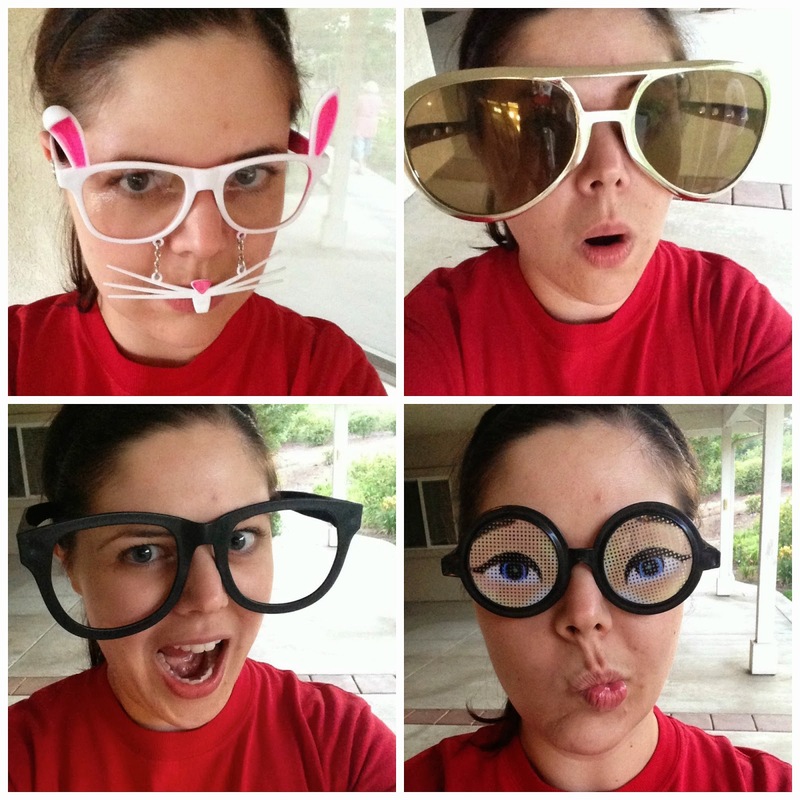 I'd almost have to say that the silly glasses selfies might have been my favorite part of the weekend. Seriously, I was dying laughing for like a half hour. SO. MUCH. FUN. Day 2 went by all too fast and was spent the same way as day 1 : eating, talking, scrapping, eating, talking, scrapping, eating, dessert, scrapping, talking. Oh and getting a picture of my little love so happy after swimming. Day 3 came before I knew it and I was so sad to have to leave. Besides my pages and my selfies, I did manage to take one picture of my table on day 3. The picture doesn't do the mess justice. It almost looks clean in this picture. This girls weekend was just what I needed. A couple weeks ago I shared about mommy guilt. And to be honest, I didn't feel any this weekend. I can't explain it. I don't know if it was because it was planned ahead of time and I knew I was going for a couple months, but I just had a plain good time and didn't feel guilty. I don't know if that sounds bad or if that's good. All I know is that I had the best time away with the girls. It gave me the recharge that I needed and I am ready to spend every minute with my boys again. Sometimes a mom just needs a little getaway. What a fun weekend! I think I need a girls weekend! YAY! What a fun weekend that you TOTALLY deserved! I'm so proud of you for letting yourself enjoy without the guilt! My first girls trip (only 1 night away) is coming up next month and I'm excited but nervous... nervous since it's my first time leaving Mia! I'm not a scrapbooker but a trip away with the girls sounds great fun! Looks like you had a blast and a well deserved mommy weekend! i'm loving this girls getaway!! it looks SO PERFECT and SO FUN!! What a fun idea!!! An a great way to get away and get a huge chunk of scrapbooking in. Your selfies are too fun!! :) What a nice (and productive) weekend, glad you were able to enjoy and recharge!! We ALL need those every once in a while. It's a good thing, you nut! It certainly looks like a great time, but you must explain the scrapbooking thing! Do you buy all the bits, do you bring them, is it a set price and you go to town? 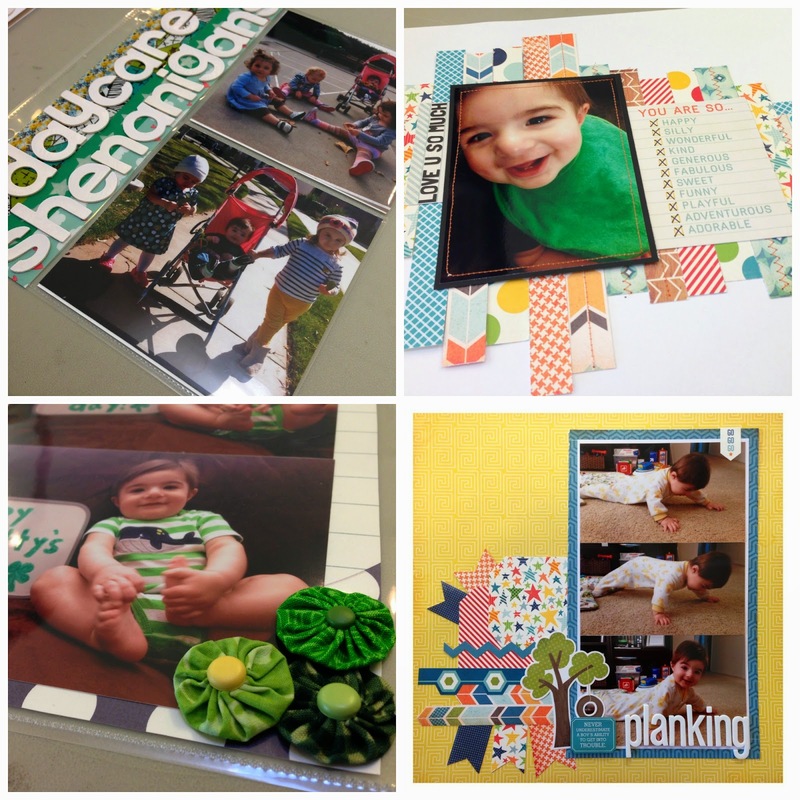 oh man a weekend with scrapbooking...I'd get so much done. I have a running scrapbook from 2003 but I am behind by like 3 years ha. For some reason having a kid has totally put a cramp in my scrapbooking time. I'm up to my wedding in 2011 though..I wanna go next time! I used to scrapbook but haven't in a couple of years. Your pics are inspiring me to start again! !